Flea Style (formerly The Dallas Flea) is taking its popular one-day market on the road this spring and setting up shop at Houston’s Silver Street Studios on May 7th. The event plans to have two shows a year in Houston (the second is slated for November 19th). Flea Style selected Houston as its first sister city location for its vibrant art scene and enthusiastic shoppers who have made their passionate demands heard for this curated marketplace hawking handmade, vintage and one-of-a-kind items to come to town. Attendees can expect 100-plus booths manned by artists, collectors, thrifters, junkers, pickers, painters, calligraphers, designers, potters and more. Vendors are traveling from all over Texas, and as far away as Oregon to showcase their wares. The incredibly talented lineup includes Tyler’s AAVintedge (vintage women’s clothing), Dallas’s Cowgirl Cuties (vintage cowboy boots), Portland, Oregon’s Ladies of Paradise (boho jewelry) as well as Houston darlings Manready Mercantile (gorgeous goods for guys and the home), Sunchild (beautiful handmade objects), Lynne Goode Vintage (retro/mid-century furniture) and Bole and Buck (rustic kitchen/home goods). Flea Style carefully curates its vendors to highlight unique, handmade, vintage and one-of-a-kind lifestyle wares, including: clothing, jewelry, art, furniture, décor, lighting, dog gear and children’s items. In addition to booths brimming with exceptional finds, shoppers can expect fun activities including The Shutterbus Photo Booth, a DIY floral crown station, live music and giveaways. And because even the most eager of shoppers needs to rest and refuel, there will be food trucks providing sustenance and a bar slinging drinks. 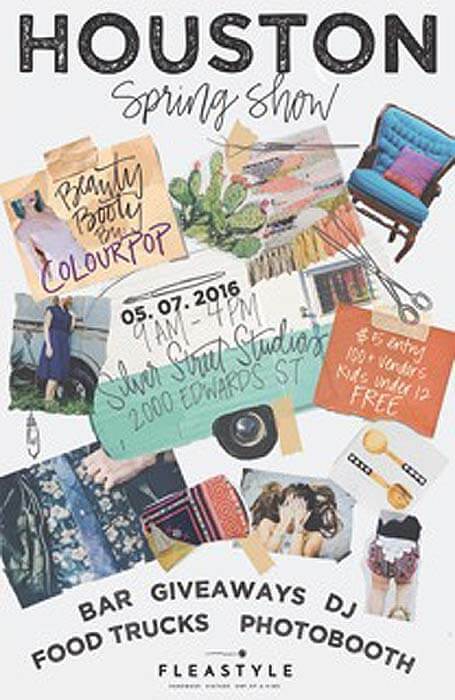 Flea Style takes place Saturday, May 7th from 9 a.m. to 4 p.m. at Silver Street Studios, which is located at 2000 Edwards St. The first 100 shoppers will score a free canvas tote goodie bag. Tickets are just $5 cash at the door, or skip the entrance line by purchasing pre-sale tickets HERE. Kids 12 and under get in free. For more information, please visit the WEBSITE, and to keep up with the latest developments, check out the BLOG.